by James M. Houston, Michael Parker. InterVarsity Press, 2011. 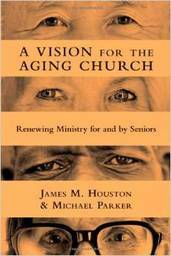 Former professor and author James Houston and gerontologist Michael Parker look at the elderly and see gifts and graces for ministry, yet they wonder why congregations see the elderly and think “shut-in,” instead of as assets with wisdom and courage. The book has five parts. Part one identifies the challenge: how did the elderly become shut-ins, and how has the church responded to an ever-increasing aging population in its midst? Part two explores the status-loss for the elderly through a historical, biblical, and cultural lens. Part three offers success stories from congregations who see the elderly as vital for the church’s mission. Part four encourages and helps the elderly to navigate the waters of aging, and part five reflects on “finishing well.” Christians will find themselves most at home with this text, though it is practical, user-friendly, and full of helpful observations and ideas for any congregation.